I'm a huge fan of pink lipsticks so it's no surprise that a lot of my lipsticks are dupes for each other. It's rare that you'll find me wearing anything other than pink on my lips and I love anything that gives me that 'My Lips But Better' shade. Recently I reviewed the Kylie Cosmetics Lip Kit in Smile and as it's currently not stocked on Kylie Cosmetics I was wondering what I would do when it ran out. Turns out the perfect dupe arrived in the mail a couple of weeks ago as a free gift with purchase from Limecrime. 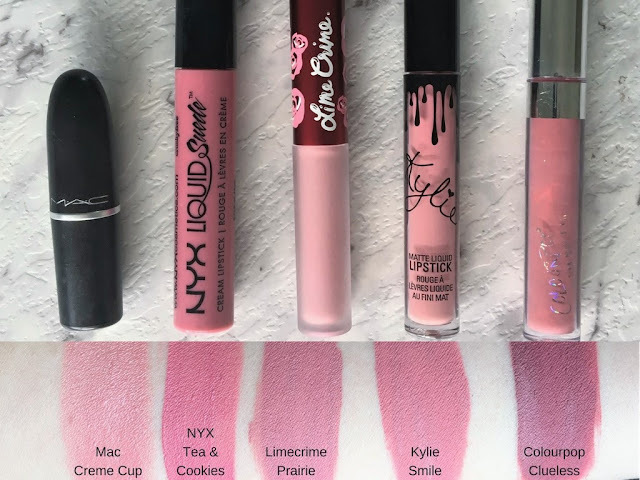 As you can see from the swatches above the Limecrime Velvetine in Prairie is almost identical to the Kylie Lip Kit in Smile. The NYX Liquid Suede is the next closest in colour but is more velvety in texture. Mac Cosmetics Creme Cup is perfect if you prefer the original bullet type lipstick and is such a lovely creamy lipstick, definitely pick this one if you're not into the current matte liquid lip trend. I wore this on my wedding day with a liner underneath and it's a perfect my lips but better shade. Colourpop Clueless is obviously the darkest of the shades but if you have a medium skin tone this could still be a great natural shade for you. It's also the cheapest of the bunch so it's worth a try if you're on a budget. Of them all I have to say the Kylie Cosmetics Lip Kit in Smile is my absolute favourite. It applies smoothly and lasts so long with minimum touch-ups required. Limecrime Prairie comes in at a close second only because it just doesn't quite have the staying power that the Kylie one does. I use all of these lippies often, if I'm wearing lipstick it's pretty much always gonna be pink! What's your favourite shade of lipstick? I'm a fellow pink lipstick wearer, but my favourite pinks are a bit browner than yours as the candy pinks can make me look a bit sickly. I haven't tried any of the Kylie Cosmetic liquid lipsticks yet but I'm glad to hear they are long lasting. Another brand to add to the must try list!